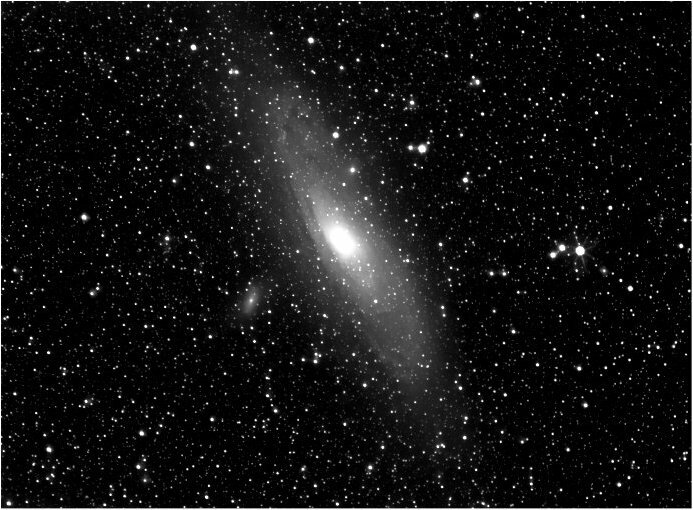 One of the closest spiral galaxies to the Milky Way. First calibration shots of new ed80. 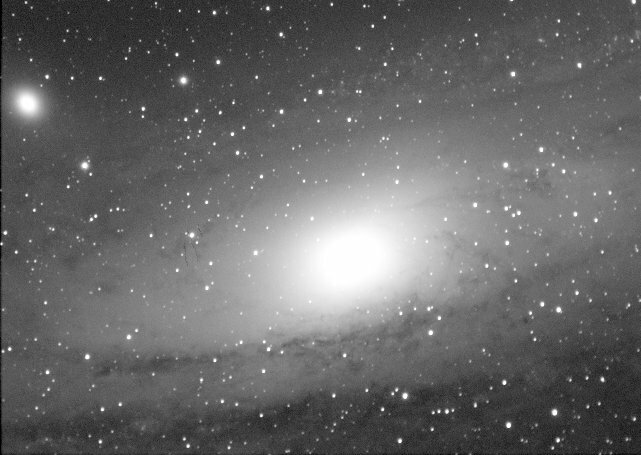 Only 89 x 20 sec sub frames ( before the clouds rolled ) in of the clouds within m31.Pinpoint stars and lovely cloud detail has demonstrated the ed80 to be an excellant widefield imager. More to come! Post-processing stacked,d.framed and aligned in AA3, mild ddp. Camera Starlight Express hx516 with ICX424AL chip and 0.5 Focal reducer. Test image through a 135mm canon FD lens. I had to half close the iris as the stars get pinched when using full aperture. I don't think the lens was designed for astrophotography! Mount EQ6 skyscan guided through mn56 with sxv guidehead. Post-processing stacked and aligned in AA4, mild star bloat, no dark frame. Filters Toshiba 58mm SL-C IR lens. Upon closer examination there is an object passing through the field of view with a smaller sister object next to it. It is definately not a hot pixel, nor a satellite in geostationary orbit . 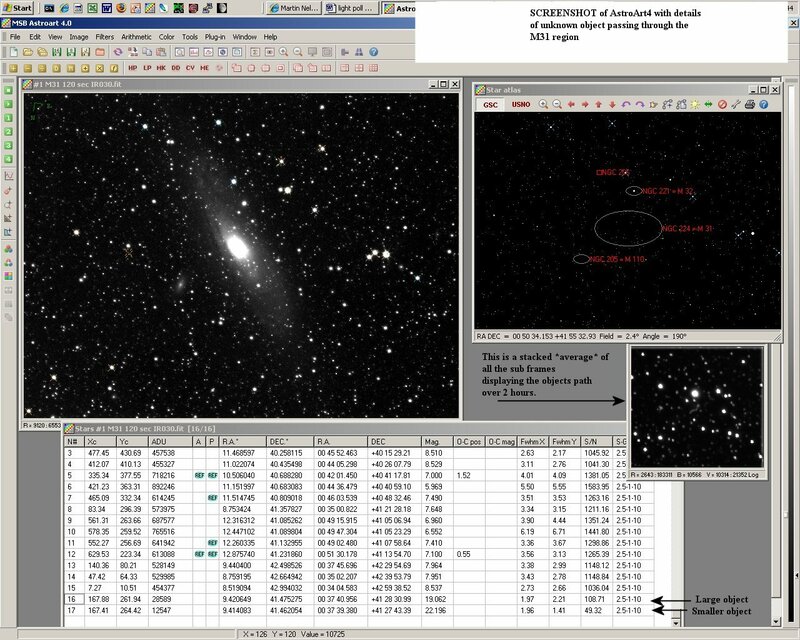 I am yet to identify this & cannot see any matching objects in the latest MPCORB.DAT files , nor the Minor Planet Checker databases. 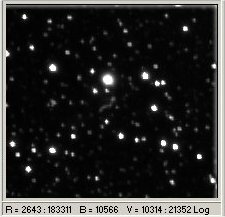 The initial frame was taken at 23:56 on the 26/10/2006 UT with the final 60th frame completed at 01:58 on the 27/10/2006 UT, each frame being 120 secs in length. This is an average stacked shot, displaying the path the object has taken. Ra , Dec, astrometry & photometry of the objects ( no. 16 and 17 ) can be found at this screenshot here .